The top two sides from each group will advance to the Super League while the remaining eight teams will figure in the plate championship. 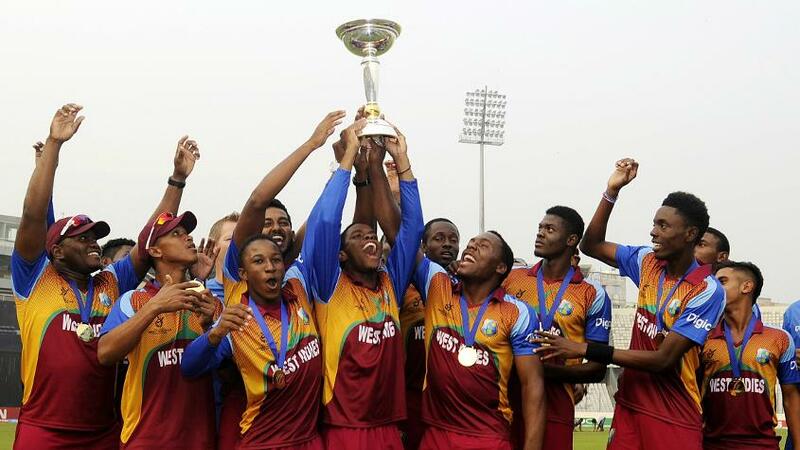 Defending champion West Indies will open its campaign against host New Zealand in next year’s ICC Under 19 Cricket World Cup, the schedule for which was announced on Thursday. The West Indies will play the inaugural Group A day-night fixture at Bay Oval in Tauranga on the opening day of the event which runs from 13 January – 3 February featuring 16 teams across seven venues in four cities – Christchurch, Queenstown, Tauranga and Whangarei. 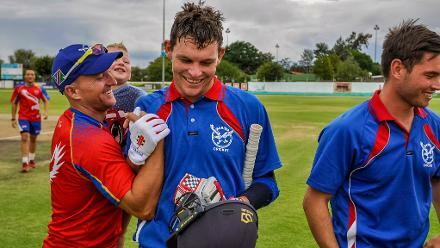 The 10 Test playing nations (prior to Afghanistan and Ireland’s recent inclusion) gained automatic qualification to the event along with the best finishing associate from the last edition, Namibia. They are joined by five regional qualifiers in the biennial tournament that showcases future stars every two years. Past alumni of the ICC U19 Cricket World Cup include current captains Steve Smith (Australia), Virat Kohli (India), Kane Williamson (New Zealand) and Sarfraz Ahmed (Pakistan). The other teams in Group A are 2012 champion South Africa and Africa qualifier Kenya while three-time champions India and Australia are clubbed together in Group B along with Zimbabwe and East Asia Pacific qualifier Papua New Guinea. Bangladesh, Canada, England and Namibia comprise Group C while two-time champion Pakistan, Sri Lanka, Asia qualifier Afghanistan and Europe qualifier Ireland form Group D in what is the 11th edition of the tournament and the third to be held in New Zealand. The top two sides from each group will advance to the Super League while the remaining eight teams will figure in the plate championship. The quarterfinals, semifinals and final of the Super League will be among the 20 matches to be broadcast live. The final will be played at Bay Oval in Tauranga on 3 February while both semifinals will be played at Hagley Oval in Christchurch on 29 and 30 January. The plate tournament will run simultaneously but end with the final at the Bert Sutcliffe Oval in Christchurch on 28 January. 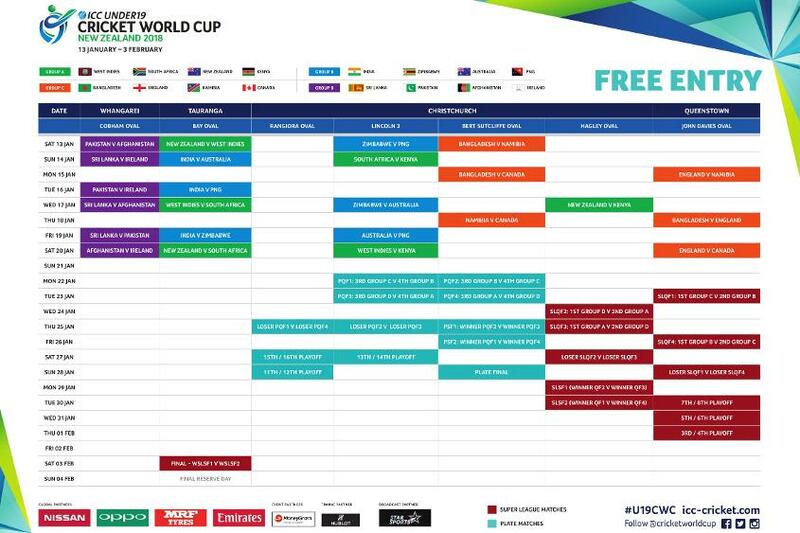 Entry to the grounds will be free for the ICC U19 World Cup giving cricket fans in New Zealand a superb opportunity to see tomorrow’s stars today. The event will replicate a major ICC tournament in terms of organization and playing facilities giving players their first taste of competing on the global stage. ICC Head of Events Chris Tetley: "The ICC U19 World Cup plays an important role in the progression of young talent onto the global stage. The list of past and current players who had their first taste of a major event at this tournament is a long one and I have no doubt we'll be witnessing some of tomorrow’s stars in New Zealand next year." Tournament Director Brendan Bourke: “This will be the most accessible international event ever staged throughout New Zealand, with free entry to all games, so we look forward to opening the gates to our match venues in a little under five months’ time. The captains of the teams coming through the Qualifiers are looking forward to the tournament, which is a stepping stone in the development of all participants – players and match officials. Afghanistan captain Naveen-ul-Haq: “The aim is the same as that of any cricketing nation - this dream of winning the World Cup. For us it is also the same, to go out there and play some positive cricket and lift the trophy for the country. Teams will get to tune up for the main event with practice matches from 8-11 January.